One million dollars - moot! Back in Uni it was all the rage to wager the right to dance on one's grave. I don't remember what the bet was and I'm sure it was important at the time but I won the right to dance on Henry's grave sometime around 1999. I suppose he wasn't too worried given the impending doom of Y2K. Post-Y2K (sometime around 2003/04) he expressed interest in re-purchasing the right to dance on his grave. I offered the price of one million dollars. Research by Henry revealed at the time that one million Zimbabwean dollars translated to roughly AUD 13. 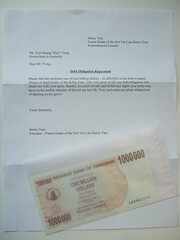 However obtaining one million ZWD turned out to be much harder than using an online currency converter. When we were in London in June 2006 we stumbled upon some markets where one seller was peddling foreign currency in various denominations. Fortunately for me they did not have anything approaching one million ZWD. Today I received the letter & cheque attached (best viewed large). I guess I hereby forfeit my rights to dance on the grave of the Not Yet Late Henry Tam. \n\nBack in Uni it was all the rage to wager the right to dance on one's grave. I don't remember what the bet was and I'm sure it was important at the time but I won the right to dance on Henry's grave sometime around 1999. I suppose he wasn't too worried given the impending doom of Y2K.\n\nPost-Y2K (sometime around 2003/04) he expressed interest in re-purchasing the right to dance on his grave. I offered the price of one million dollars. Research by Henry revealed at the time that one million Zimbabwean dollars translated to roughly AUD 13. However obtaining one million ZWD turned out to be much harder than using an online currency converter.\n\nWhen we were in London in June 2006 we stumbled upon some markets where one seller was peddling foreign currency in various denominations. Fortunately for me they did not have anything approaching one million ZWD.\n\nToday I received the letter & cheque attached (best viewed large). I guess I hereby forfeit my rights to dance on the grave of the Not Yet Late Henry Tam. This page contains a single entry by goosmurf published on June 2, 2008 12:01 PM. First Home Saver Account flawed was the previous entry in this blog. Balmoral Boards, Dell & good customer service is the next entry in this blog.